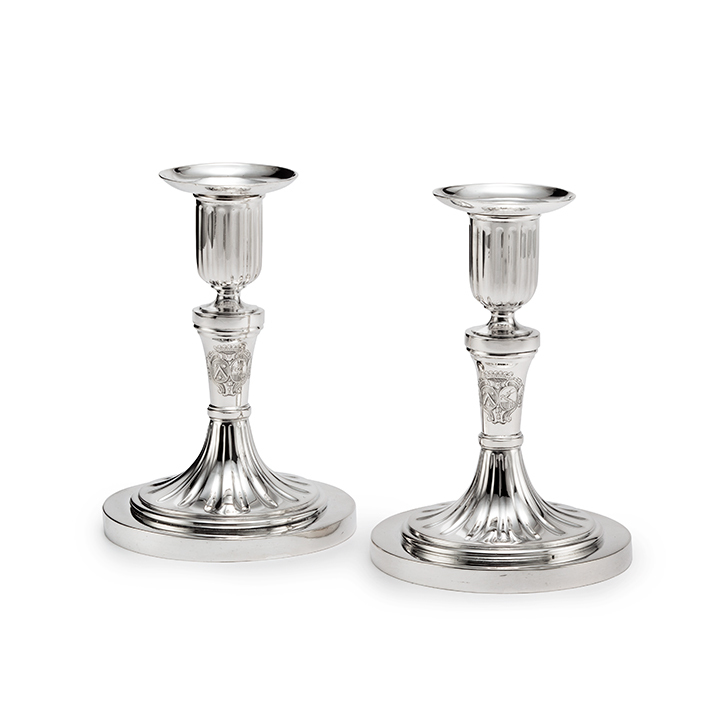 The candlesticks consist of a round base, which is partially fluted and transitions into the stem, engraved with the coats-of-arms of HOPE and VAN DER HOEVEN. 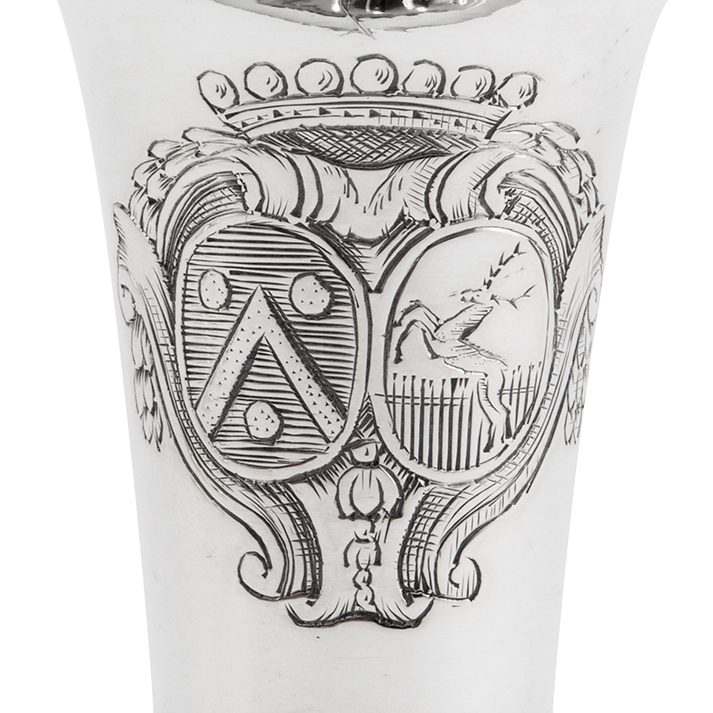 The sconce is fluted in similar outline and has a detachable nozzle, which is engraved with the same coats-of-arms. Fully marked at the reverse of the base, displaying assay stripes. The coats-of-arms are those of John Hope (1737-1784) and his wife Philippina Barbara van der Hoeven (1738- 1790). This couple married in 1763. Hope was a famous Amsterdam merchant and banker. He was governor of the East India Company and many times a member of the Board of Aldermen in Amsterdam. These small candlesticks, possibly made as gaming table candlesticks, were manufactured in 1784, the year John Hope died. 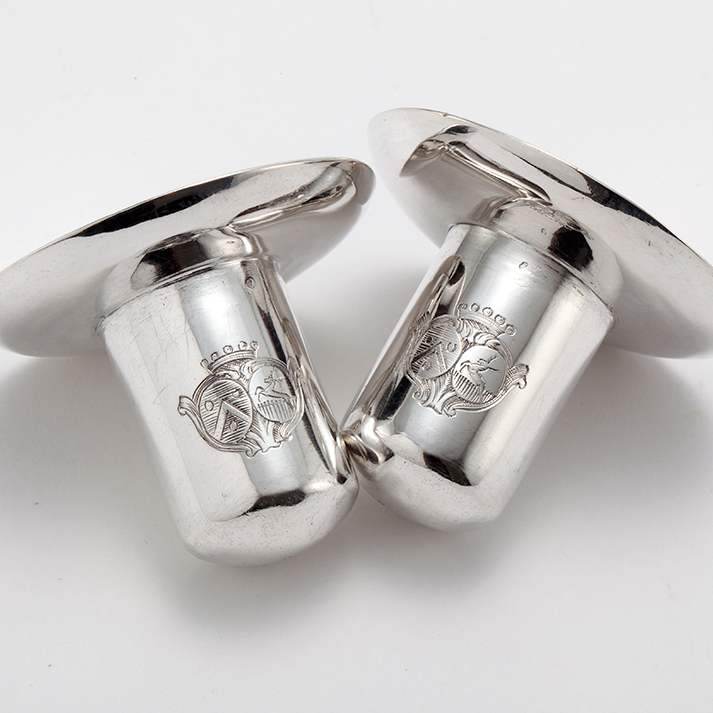 They are included in the catalogue associated with the exhibition at the Rijksmuseum, dedicated to the work of silversmith Johannes Schiotling (Cat. 37). John Hope (1737-1784) was a fabulously wealthy Amsterdam banker of English origin. In 1763 he married Barbara Philippina van der Hoeven (1738-1789), daughter of a Rotterdam regent. They had three sons. Besides a house at Keizersgracht and Herengracht in Amsterdam and a house in The Hague, John Hope had various estates, namely Groenendaal, which he merged with Bosbeek in Heemstede and Castle Nederhorst, which allowed him to be called Lord of Nederhorst and ’s Gravenambacht since 1774. John’s ambitions were not only in trading. In 1765 he became alderman of Amsterdam, in the Amsterdam Council in 1768 and in 1770 he became governor of the VOC. Besides houses John also collected art. In 1771, together with his uncle Adrian, he bought paintings from the estate of their Rotterdam friend Bisschop. The Bisschop Cabinet was a renowned collection, containing paintings of almost all Northern and Southern Dutch 17th century masters. This collection John Hope filled with paintings by Rembrandt, Ter Borch and Metsu from the collection Braamcamp. He had an extensive collection of sculptures in marble, stone, ivory and plaster, Japanese lacquer ware, porcelain and antique mosaic table tops from the excavation at Tivoli. -Collection Joseph M. Morpurgo, Amsterdam, ca 1960-2016. -Exhibition catalogue, Johannes Schiotling, een Amsterdamse zilversmid (1730-1799), Rijksmuseum Amsterdam, 1976, cat. nr. 37. – J. Verbeek, Antiek, Johannes Schiotling, zilversmid (1730-1799) en John Hope, bankier (1737-1784), 11e jrg nr. 6, 1977, pp 523-524, afb. 12. -J.W. Niemeijer, ‘De kunstverzameling van John Hope’, Verzamelen in Nederland, Nederlands Kunsthistorisch Jaarboek nr. 32 (1981), pp. 127-232.